Norfolk, beautiful place. Sun was out today so we headed out to Cromer Rescue Day. Ben donning his bright green sunglasses that make him look like the coolest dude in town, although he still refused to wear a short sleeve top. Flossie dressed warmer as no matter the time of year she always has the coldest hands and feet. Into the car, down to Cromer, and we found a disabled parking spot (and got into the right lane of traffic in Cromer town centre, double bonus!). We headed straight down to the front, down the cobble lined rampway, the tide was in so we had a quick foray onto the beach. Ben throwing stones into the sea and Flossie appreciating the view. Back up onto the promenade, and onto Cromer Pier, I was impressed by how the steps and rampway merged onto the pier, proving that accessibility doesn’t have to be unstylish. Flossie herself was more impressed by how the wind caught her hair whilst on the pier, and had a big smile on her face. Today was Cromer rescue day and we walked to the end of the pier to see the lifeboat. We were made to feel very welcome. The lifeboat itself was not wheelchair accessible, but we lifted Flossie out of her wheelchair and carried her on board. I was immediately struck by how steep the launch ramp was, and one of the RNLI volunteers explained that the boat actually tilts and then is launched. I made my mind up there and then that I could never be a RNLI volunteer at Cromer as my stomach would not get over the initial shock of going on the start of what must feel like a rollercoaster ride… Flossie herself was really impressed by the lifeboat itself, I don’t know if it was the colour orange, or whether it was because it was so shiny but she had a great big grin on her face as I carried her around. Time to disembark. A wander off the pier and a look around the stalls dotting the seafront. We found a stall selling scrumptious homemade cakes so we duly bought some of those (proceeds of which were going to the RNLI so surely that means that the calories don’t count…), round via the hook a duck, and then to the vintage ambulance and the newer police cars (where both Ben and Col enjoyed trying on the police helmets). I sat down to give Flossie her dinner while Col sat Ben on the RNLI tractor (he didn’t look impressed…), so they then went to have a look around the museum. Flossie fed, we had a quick look at the tractor, and then had a quick chat with the Mayor of Cromer who had come down to watch the proceedings. I gave him one of my Changing Places feedback forms and explained that there was nowhere that I could safely change Flossie in Cromer. “Oh we have the Mobiloo coming to Cromer Festival”, “Fantastic” I replied, “but that doesn’t help out with our current problem of where we are going to change Flossie today”. Feeling safe in the knowledge that I should be able to change her on a babychange somewhere later, but knowing that one day this WILL be a real problem for us. The RNLI were about to launch their lifeboats. I carried Flossie onto the beach (it really would have been impossible to push the wheelchair on this shingle). We got a fab position. We watched the smaller lifeboat being launched with the tractor, going out to search for a volunteer “in distress” in the sea. Then the big lifeboat launched from the pier with a huge splash. It was all very impressive to watch and well worth the day out. We went for a wander into Cromer town centre, the traffic was busy but we noticed the church and realised it would be an island in the storm, when we got in we also realised that there was somewhere for Flossie to have a roll around in the back, (she gets fed up if she’s sat in her wheelchair all day), and some toys. Col left us there while he went off to get us some food and we headed into the play area. 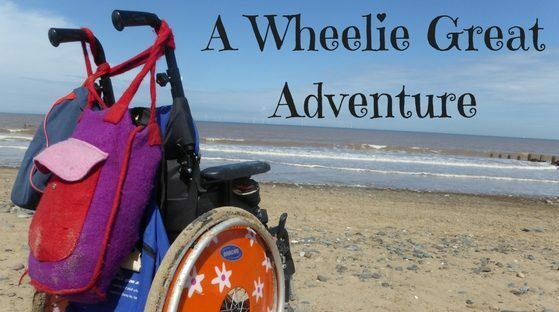 I lifted Flossie from her wheelchair and my heart sank. She was soaking wet through. I didn’t know how long Col would be, he rarely carries a mobile phone. I knew that the nearest Changing Places toilet was miles away (when I googled later it was over 13 miles away), as mentioned earlier we can still often change Flossie on a baby change but I didn’t even know where the nearest loo was (or whether there would be a baby changer in there that would take her weight…). So Cromer, I’m sorry, but I changed my 7 year old disabled daughter on the floor in the back of your church, because I didn’t know where else to go. Walking her around town leaving her sat in soaking wet clothes while we found somewhere else to change her was definitely not an option. My earlier confidence that I could sort her without resorting to a toilet floor had evaporated. I was mortified. I positioned the wheelchair so nobody could see, to try and preserve my daughters modesty and dignity, and then just hoped against hope that we wouldn’t be interrupted. As quickly as I could I changed my daughters clothes and nappy. Afterwards she played happily, she none the wiser about how undignified the whole situation was, While I reflected on how it can be that towns across the UK still have no Changing Places toilets for their tourists and residents. Today proved that it was possible for us to get caught out by Flossies needs and I know that one day todays solution will not be effective for us. I have emailed Cromer town council and the response I received was very apologetic that I had to resort to such desperate measures and that they hope to provide a Changing Place facility in the future. There is a fantastic campaign to get these facilities into Cromer and you can follow that campaign here. There are only 4 registered Changing Place toilet facilities in the whole of Norfolk. I have emailed all the Norfolk councils previously to ask that these facilities be included in new developments, the situation is obviously yet to improve. ‹ PreviousThe Best Climbing Tree In The World…? Cromer Town Council should be horrified that this happened. I am assuming that the town council has a duty to provide toilet facilities. As such, Flossie was treated less favourably due to disability. They should be very aware of the Equality Act. Including my own city centre, Truro. There was a less than heart felt apology here and I am seriously considering legal action. People with disabilities live all around the UK, with only a 1000 such facilities it is very obvious that the Government should and could do more to ensure more facilities are provided, too many disabled children, teenagers and adults, along with their carers, are being put at risk, in one of the wealthiest countries in the world.